Design is subjective but the main task for any designer is to interpret and communicate a brand story, this all starts with the brief from the client. The brief is the foundation for creating the exact message that the client wants. 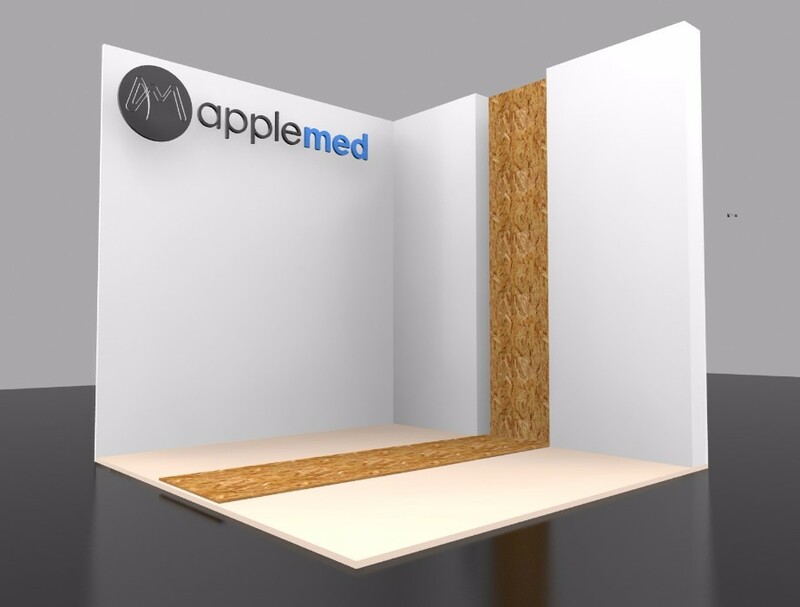 This section shows you a little bit about the design process here at Applemed, in this example we have used ourselves as the client. 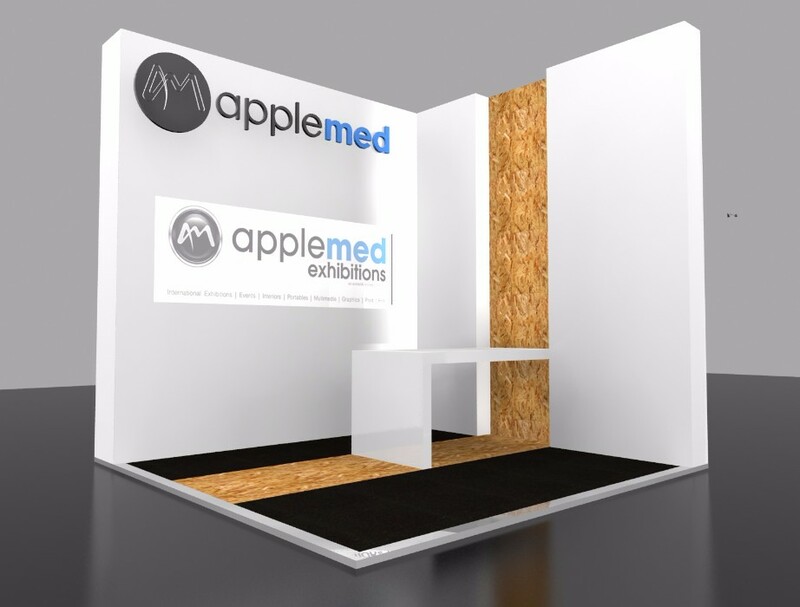 To create a 4m x 4m stand that is open on 2 sides, this stand needs to be clean showcase what we are capable of doing within our workshop and with our technical partners. 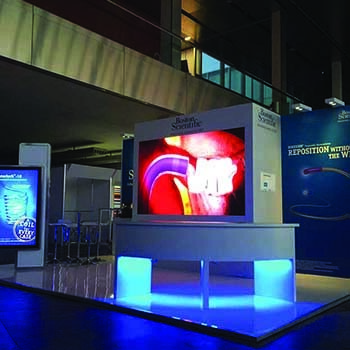 It requires a screen on the back wall, company logo, there isn’t any physical product on display other than A4 portrait brochures which need to be accessible to the aisle for passing trade. 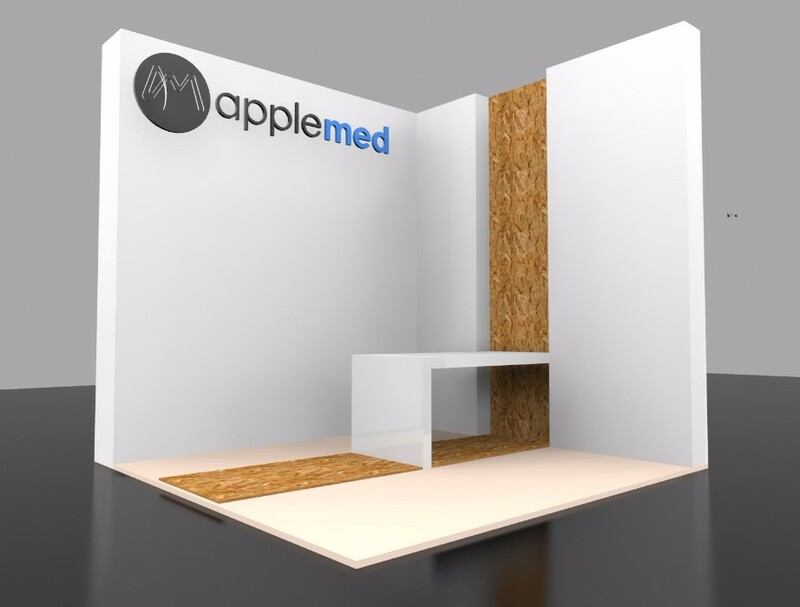 We require a small informal meeting area in the centre of the stand where Applemed employees can interact with their clients. We wanted to showcase the quality of our work, as well as AV capability, our CNC machining, and that we aren’t afraid to use different materials to create an impact. 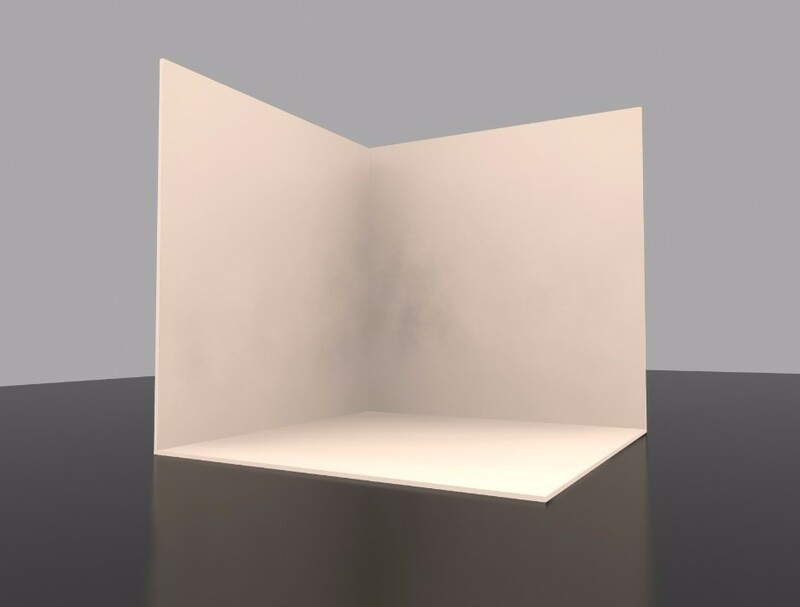 The initial design process starts with our designers sketching a couple of ideas down on paper and then taking these into our 3D package to produce the final visuals that our client will see. Drawing the floor space is the most obvious but key starting point, if this floor is 18mm floor flats (chipboard) or 40mm floor with is our flooring system created with 0.5m x 0.5m plastic sections which we can weave cabling through, then this goes to 100mm platform which is mainly for stands that require water and waste to the stand or if you have a double deck structure on your space. For this exercise we went for a 40mm platform. Again an obvious next step, but this is where we start to decide how we make your stand, this could be from 18mm pre-laminated MDF sections (limited to 3m and lower), or stock walling which is baton and ply covered in a choice of materials, from paint to a full graphic wrap to the wall the later gives you a seamless look to your stand. In this case the design showcases 4m high stock walling. This is another decision which is key, to give you the most visibility the higher up the wall the better so you can be seen from a far, but depending on what the content is you also may require a logo lower down at eye level. 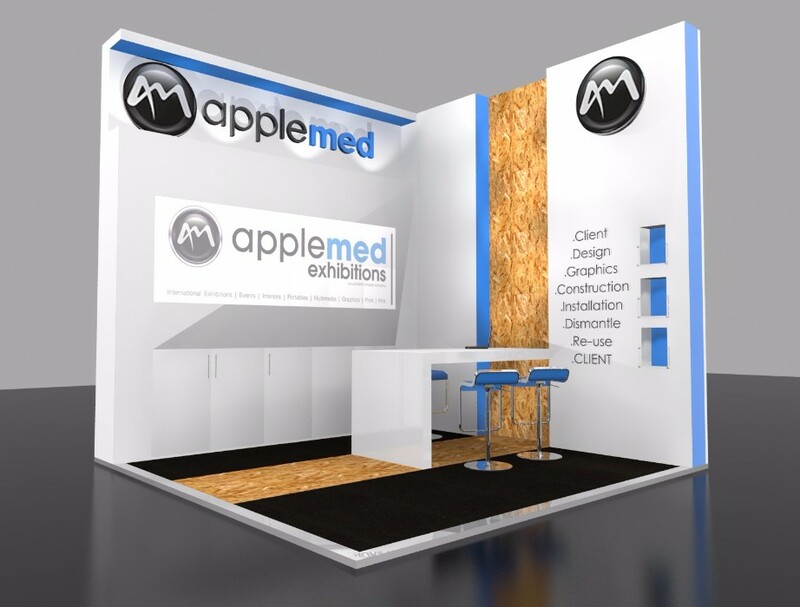 If your stand doesn’t have a lot of content then it is key to give your stand interest within this design a decision was made to thicken up the wall to add a depth and structure to the stand with a material detail to the centre this would then have recessed LED tape down the length to high light the different material. 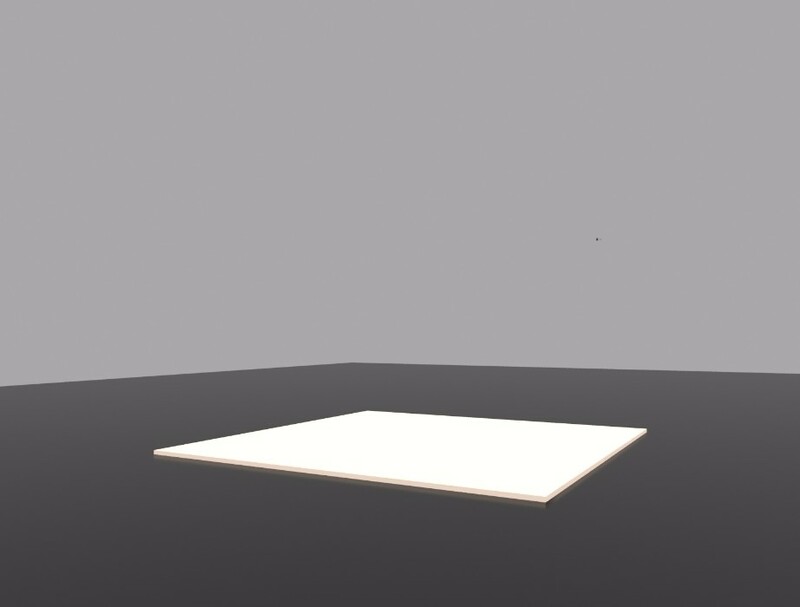 This also creates a focal point to the stand which will get enhanced with the next stage. With this design an informal meeting space was to be created, to further draw the eye to the detail within the wall a table at stool height is added, as you can see this is only a top and 1 leg to make sure the stand still feels open and inviting, you don’t want to create barriers on your stand if you want a high foot fall. However having walling all the way around your stand so its private can also work equally as well if there are vision windows into your stand creating curiosity, it all depends on how you want to interact with your clients. Audio visual placement this isn’t compulsory to have on a stand. If you have a demo video or a product video that is interesting for passers-by then this is great. 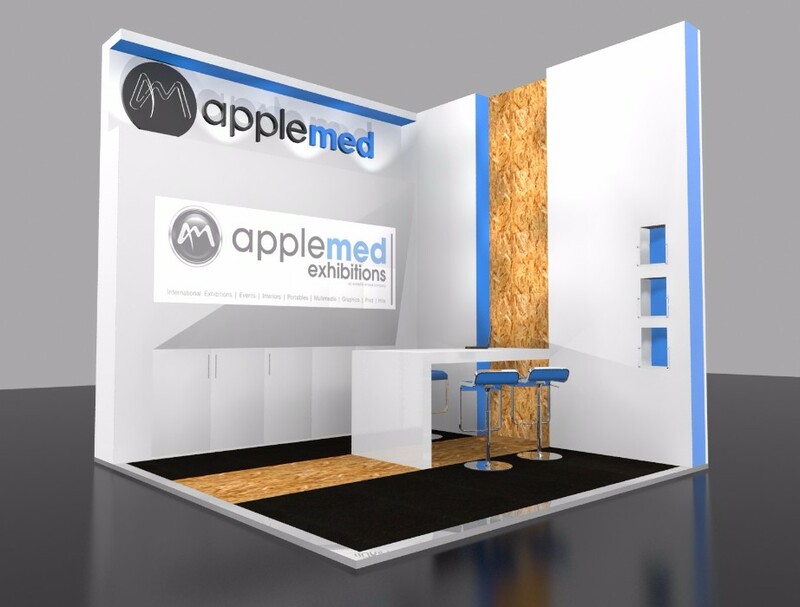 As we say at Applemed content is KING and QUEEN! 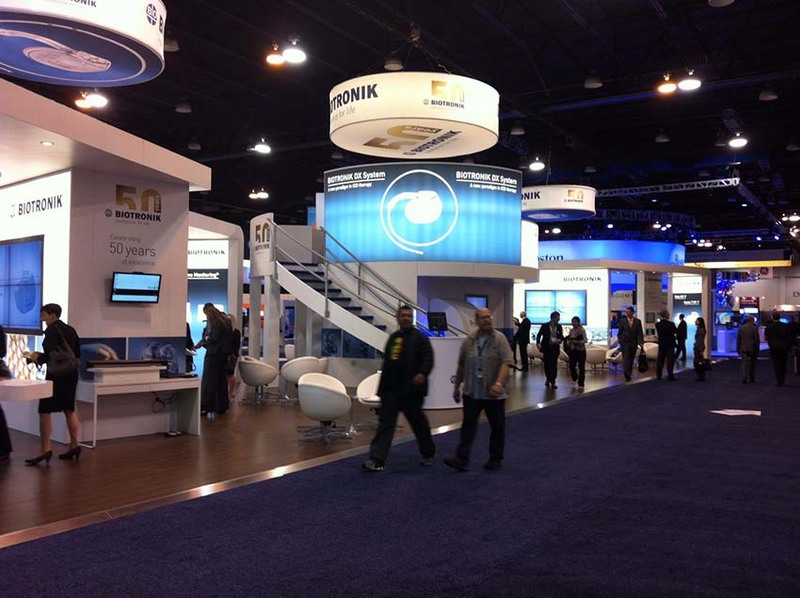 With AV placement this should usually be at eyelevel as moving images / sound draw people’s attention. A word of warning if you have sound make sure it is something you would like to listen to all day every day of the exhibition or make sure you can turn the sound off and not lose anything by doing so as this has the potential to get on your nerves be mindful your clients are only on the stand for minutes but you are on the stand for hours. Thinking about storage you will have brochures, coats, bags, laptops, phones these all need to have somewhere safe to store them preferably lockable. This storage is also going to be where your stand services will be as well for access so whatever storage you may think you need you might need a little more. Storage can come in the form of a Store room access by a door so you can walk into it this is the most practical. In the case of the design here we opted for cupboards under the screen for all the essentials again this is personal preference but this was chosen to keep the stand looking sleek and uncluttered it also doesn’t take up as much space on the stand as a storeroom would need to be a minimum of 1m wide which means you lose at least 1sqm of your stand. This is so that the stand all ties together using key colours from your logo is what we use to reinforce your brand. This can be a feature wall or highlight an edge or a detail on the stand. I saved graphics until the end as this is the most important element of a stand the graphic content isn’t just your logo it is what you’re selling. In the case of this design the message is our design processes starts and ends with you, our client.